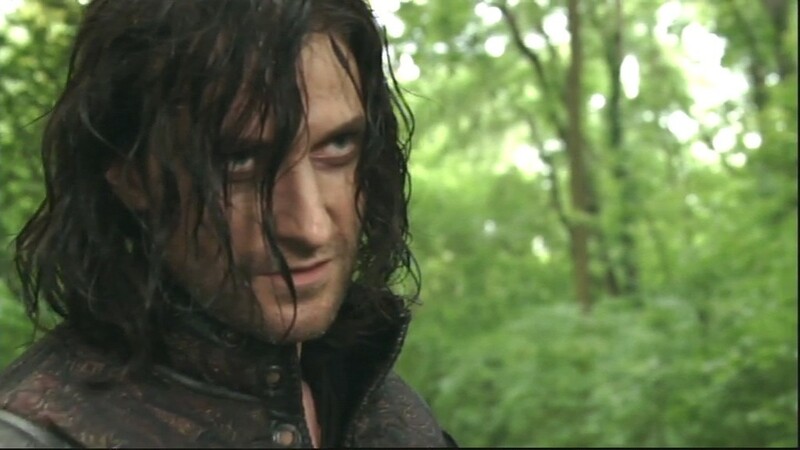 Today’s calendar image of Richard Armitage as Sir Guy of Gisborne was provided by Emma. As recommended, she supplied an additional image for the blog. Thanks, Emma! In the above screencap from Robin Hood season 3 episode 1, Guy clearly needs a wash. This is obviously before his makeover. Here is your Sir Guy of Gisborne calendar updated to the 28th of December. The Misty Mountain Song is still in my head. This beautiful haunting melody is sung by Richard Armitage as Thorin Oakenshield and the other dwarves. I couldn’t resist making a Hobbit music video. Even though we have almost a year to wait until the release of The Hobbit: An Unexpected Journey, Thorin Oakenshield is quickly becoming one of my favorite Richard Armitage characters. Who do you like better? Guy or Thorin? A high-quality download of the video will be available tomorrow. See you then! In the meantime, I hope you have a great day. This entry was posted in Calendar, Fan Videos, Graphics, richard armitage and tagged actor, beard, calendar, fan videos, fanvideo, graphics, guy of gisborne, hobbit, lyrics, misty mountain song, richard armitage, richardarmitagenet, richardarmitagenet.com, richardarmitagenetdotcom, robin hood, the hobbit, thorin oakenshield. Bookmark the permalink. Dear BccMee, I simply love all the very enjoyable bits you give us! Thank you and best wishes for 2012! @Lucia: Thanks and I wish you a very happy new year too! OMG, bccmee, YOU ARE A STAR!!! The music video is perfect! I can’t thank you enough! I only watched the trailer but I’m already deep in love with Thorin! Yes, I think I prefer him to Guy! I simply cannot resist Richard’s singing voice! Thanks Emma for choosing my preferred Guy S3 E1 with that dirty and tousled hair I adore! @Carla: Thanks for your kind words! @Emma: I like Thorin the more and more I see him. I’ll be ready to explode once the movie comes out, LOL! Thanks very much for your participation in the calendar! I love what you did with the song, glad you put the words there. I love seeing Thorin standing there with his pipe! Love Thorin over Guy? Oh, Bccmee, that is a hard one as I am in love with both of them! Emma, that was wonderful selection for the calendar! bccmee, I hope that, through some miracle, Peter Jackson (and RA) get to see your amazing video – I LOVE it. And yes I meant to “yell” the LOVE. It’s a keeper for sure. @Elaine: I’m so delighted you enjoyed my little fanvideo. I can’t believe how much fun they are to make! Thank you B for this awesome video. @Mamma_T: You’re very welcome! It sounds like your mind is definitely decided on the matter between Thorin & Guy! What a wonderful video! You are brilliant, bccmee! Gosh… I just can’t wait for ‘The Hobbit’! Thorin, hands down. Really don’t get the Guy love at all but to each her own. The vid, as always, is awesome! I may be more excited by that than the actual trailer! @jazzbaby1 – I agree with you – I think bccmee’s video is more interesting than the trailer too. It’s simply fabulous! @jazzbaby1: I’m thrilled that you enjoyed the fanvideo. Thank you very much! @CDoart: RA’s voice is incredible and unmistakable. How thrilling that Richard Armitage is a major character in a sure-fire hit movie. Thanks for your kind words of support. Richard’s baritone just so mellifluously lifts me out of the doldrums 🙂 He defies description! @Pamela: He is such a talented performer, it is incredible. You’re so right! @Dhana: You’re very welcome and thanks for your support! Dwarves song is still in my head, too. Bccmee, your video is really great! (Peter Jackson should hire you). @Ania: Thanks for your kind words about the fanvideo. I am posting a poll this week so perhaps you’ll make a decision by then, LOL! Bcc, the vid is so beautifully done, with so much care and attention to details that I think you managed to improve the beauty of both the song and the trailer. Again, I take my hat off to you. @Ana Cristina: You are so generous to offer to clean up Sir Guy, at least till Thorin comes around with his pipe and his song, LOL! I’m so thrilled you enjoyed the fanvideo! Love it Bcc! Richard’s singing still gets to me (in a good way, of course!) and it’s really nice to see the lyrics with the song. What typeface did you used for this? @Christianne: I’m so smitten by his singing voice but I’m trying to pace myself and not listen constantly, LOL! The font is “Ringbearer” and it can be downloaded here: http://www.dafont.com/ringbearer.font. Oh great! I downloaded the “Ringbearer” font now. Thank you!! My friends are right, Bcc.Your video is beautiful and far better than the Hobbit trailer. I´d like to thank you for to translate the song. This way is easier to me to understand what Richard sings. And his voice is amazing!I liked of all: the images chosen match very well with the lyric. I have a guess that Thorin will be so charming or more than Aragorn. BCC, how can I download this video? I looked it on your Yt channel and I didn’t find it? Thanks Bccmee and Emma, my fave Guy all long haired & tormented- delicious- best stop there!! The song sung by Richard is indeed haunting, you can imagine by surprise when turning on the TV yesterday and that exact scene came on, TH trailer was on an entertainment show, SQUEE!! Richard aka Thorin in my lounge room with surround sound booming! @Mersguy: Richard Armitage does tormented characters so well. It’s a lot of fun to see him in interviews as himself and then watch him in his roles to compare and contrast! Wow how exciting that you had a surprise visitor of Thorin right in your own home, LOL! If there was more RA on American programs, I would buy a TV for sure! Couldn’t resist another listen, my eyes well up with tears every time, how on earth am I not going to blubber like a baby when the movie comes out?? @Mersguy: I’m very moved by Thorin’s singing too. It’s going to be sensory overload at the theater! @jules: Sometimes you make me laugh so loudly that I’m worried I’m disturbing the neighbors. This is one of those times! @ Emma: Broken,beaten,disheveled Guy-love him even more! @Joanna: LOL, I like the way you think. Although he may be of short stature, Thorin has a big beautiful voice! Thanks Emma and Bccmee for the Guy screencap and calendar pic. I like S3 Guy! You’ve visualized the song perfectly! Maybe Sir PJ should hire you for his promotional videos? Thanks to Emma for the screen caps. I love RH 3 epi1 Guy–he just needs a little tending–that I could provide. Ha! @jeanniegisborne: The calendar picture scene was well-shot. 🙂 Thanks for your kind words on my fanvideo! Today’s pic was from the first episode I saw of Robin Hood and my introduction to Mr. Richard Armitage. Wow, what a trip down memory lane. Thanks. Loved the video. Genius! Thank you for showing us what was undoubtedly in Thorin’s mind as he was singing. Very perceptive!! Guy vs. Thorin? I say let them fight it out and I will chose the one left standing. Right now I see them as very similar, so I couldn’t choose one. Gizzy is not a character I would have liked were it not for RA giving him sympathetic life. Thorin is not a character I would have been enamored of either, without the promise of RA fleshing out the framework that Tolkien built. I know Thorin will be irresistible because RA has proven what he can do with Giz. So, I abstain from voting. I completely agree that Richard Armitage has a special knack for bringing unlikable characters to life with an understanding of their motives and points of view. It’s part of what makes him such a gifted actor. Thank you so much for the video of Thorin’s song so beautifully illustrated with scenes from LOTR and The Hobbit trailer. You are so clever! I cannot choose between either Guy or Thorin. I will love them both in different ways, but still prefer the real man. @phylly3: Thanks and I’m so glad you enjoyed the music video. Can’t believe how well Richard Armitage sings! I’m trying not to listen 24/7, LOL! OH!!! Bccmee!!!! I loved your Hobbit vid! Loved how you included the words and melded the whole with LOTR. Fantastic! RA’s singing is beyond compare….it touches me to my very tippee-toes. I can’t wait to get the download tomorrow! THANK YOU!!! Only cure a lost love with a new love? So many losses in 2011 (Guy, Lucas, John Porter). So in honor of the New Year, I vote for Thorin. May 2012 bring the new for all!